Grilled Asian-Style Veggie Packets. Regarding BBQ, Inc. It can be challenging to cook vegetables on the grill; they may be difficult to flip and easily fall through the grates. Making them into kababs is a solution, but that takes time, and skewers can be tricky to move around. A quick and simple method is to grill the vegetables in a foil packet, complete with a delicious sauce to add flavor while the veggies are cooking. This not only streamlines the process but also makes cleanup a breeze. This recipe uses an Asian-inspired sauce, and although it has a spicy component, it is not overbearing, rather adding subtlety to this healthy dish. You can serve the veggie packet with grilled meat or prepare it as the main dish and serve over pasta or rice. Combine soy sauce, garlic, sugar, and chili oil in a large bowl. Add vegetables to the mixture and toss to coat. Cut a piece of foil larger than the amount of the vegetable mixture. 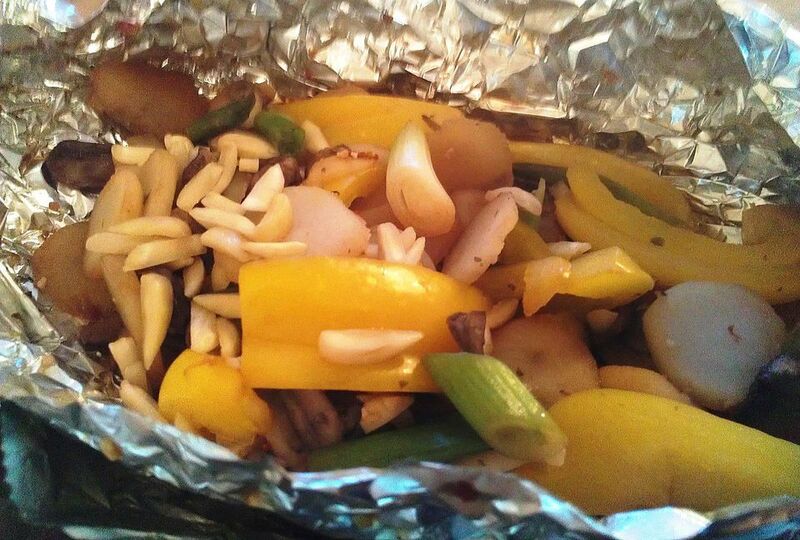 Place coated vegetables in the center of the foil piece, top with slivered almonds, seal the packet, and place on grill. Lower the lid and cook for 10 to 12 minutes. Remove from heat, let rest for 5 minutes, carefully open packet, and serve. Making the foil packet doesn't take any special technique, but you do want to make sure it is sealed well. First, be sure the piece of foil is large enough to hold the vegetables and sauce with plenty of space around the mixture so you can enclose the packet. Bring the two long sides up to meet in the middle, centered above the vegetable mound. Fold the foil over several times, creating a tight seal. When there is a little space between the foil and vegetables, fold the short sides in toward the middle and secure. Leave some air inside the packet to allow the vegetables to cook properly and not stick to the aluminum foil. You can prep these ahead of time and place in the refrigerator until ready to cook. Rather than using the grill to make these packets, they can be put in the oven. Swap out some of the vegetables for others you prefer or add to this recipe's combination. Once you make this Asian-inspired version, you can try other vegetable and flavor combinations. If you're looking for something a bit heartier, add chicken or shrimp to create a complete meal.